Located in the Latin Quarter is difficult to find a place without tourists, but at least if there are some who have a real point. As the maison des tartes. 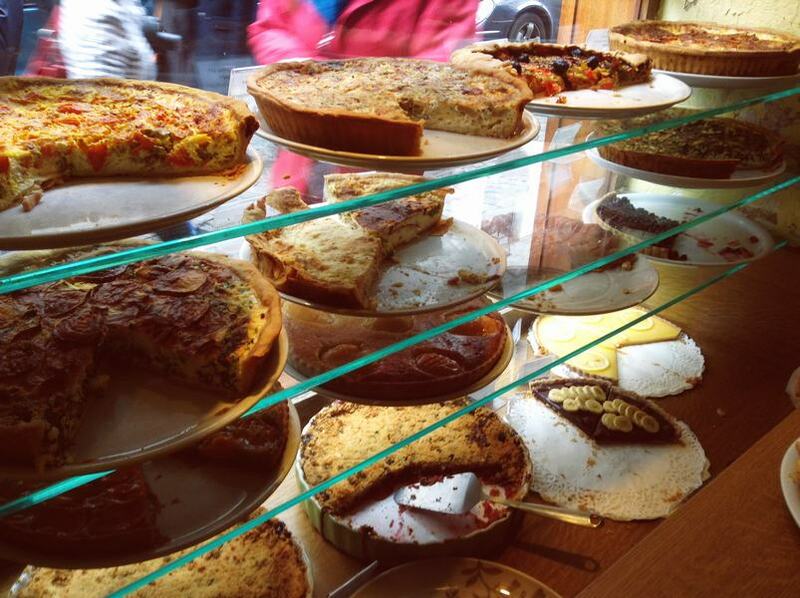 With four tables and a waitress who does everything, even sell lunches, here you can taste the typical quiche lorraine and others curious as spinach, eggplant parmigiana, etc.. If you take it here I will by 4.5 €, one less if it is to carry. All are rich but the eggplant is especially good! And also the chicken with mushrooms. And if you want something sweet, the lemon cake, though perhaps too acidic, it also leaves more to eat. And the house wine, the red burgundy, also worth a try. Pint Bottle by 6.5 €. Le marche des enfants rouge. The market for red children, named for the former orphanage that was next where children’s uniform was red. Although slowly and many home markets that are beginning to offer authentic sites to eat, we still miss the concept of food-markets in London reaches once and for all. Real sites, not the San Miguel market that has everything as well as ashamed to touch. And that which we love, but we would like a street-market where you could take different specialties, each made like a different grandmother. “Le marche des enfants rouge” is not this exactly but at least in a small space you can do a brunch at L’estaminet ecological or grab a burger with fries (supposed to also ecological …) or try Moroccan specialties or even some sushi. None of these positions will win a Michelin star but it’s a start! Like many sites, the best place for a nice dinner with friends is in your home. So it is common to see groups of young and not so young going down the street each carrying one of the ingredients. The most common bread, cheese and wine. 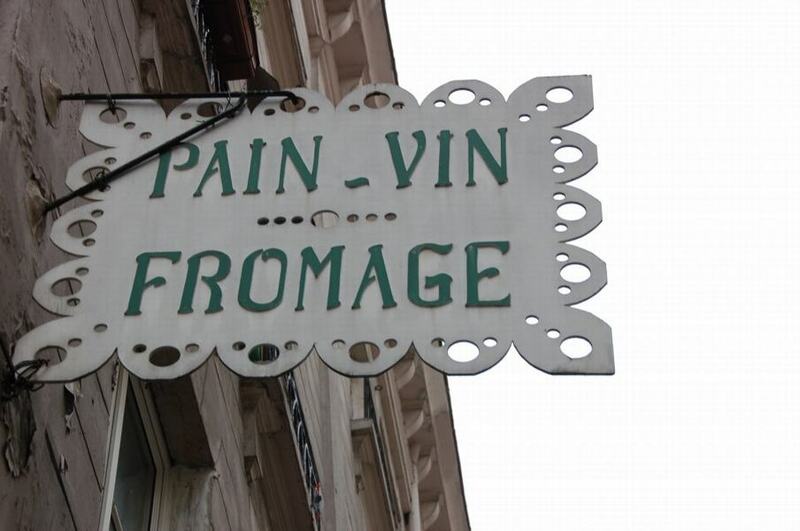 Pain, Vin, Fromage is that. A nice place to have a nice dinner with your friends. 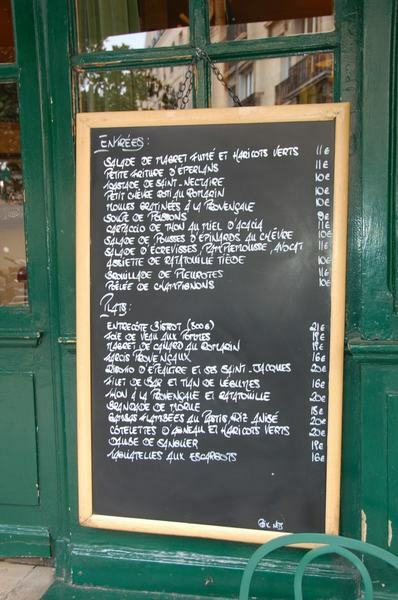 Very near the Centre Pompidou, going to Le Marais, on a small street you will find it. Do not fail to book especially if it’s the weekend! Although they bring you downstairs do not worry that you will be at home. The best, the cheese fondue. With that and a bottle of wine that you will have more leftovers for dinner! It’s a pity. Pizza Rossi is far from the most interesting places of Paris! It is one of those places that one would like to have around the house to go every Sunday. Pizza pretty cheap and lovely. That’s why we recommend the Bistro Napolitain, just above the Champs Elysees. If you read their reviews on TripAdvisor, and Homer Simpson would give free though. 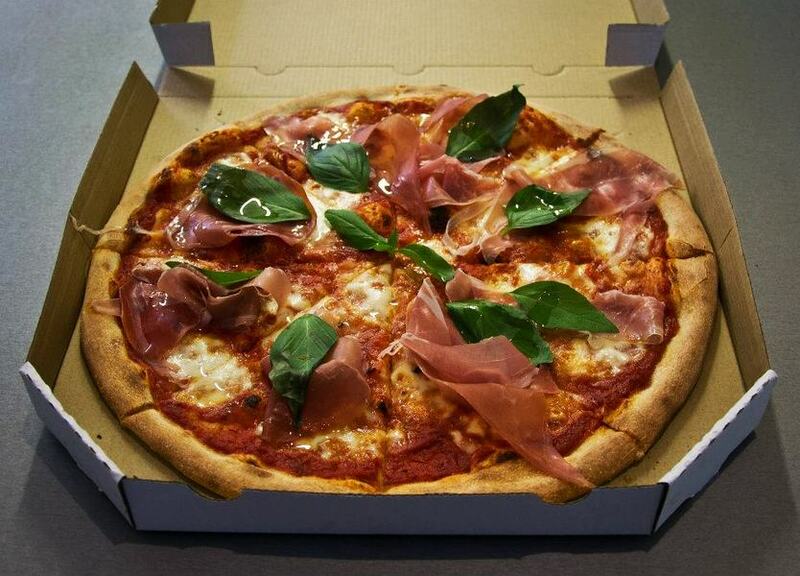 But look, there are few reviews, are all French and most are asking “the best pizza in Paris?”. The conclusion? Indeed it may be one of the best pizzerias in Paris, still undiscovered by tourists. So just Parisians reviews and so wonder how it might have that reputation. If you are from Montmartre on rue Lepic, where tourists often return walk to see the Sacre-Couer, you have the Fromagerie Lepic, where oddly enough the neighborhood, you will hear more French than other languages. If you are on the other side of the Seine, one of the most famous stores but no more expensive than others is Chez Barthélémy in the Rue de Grenelle 51. 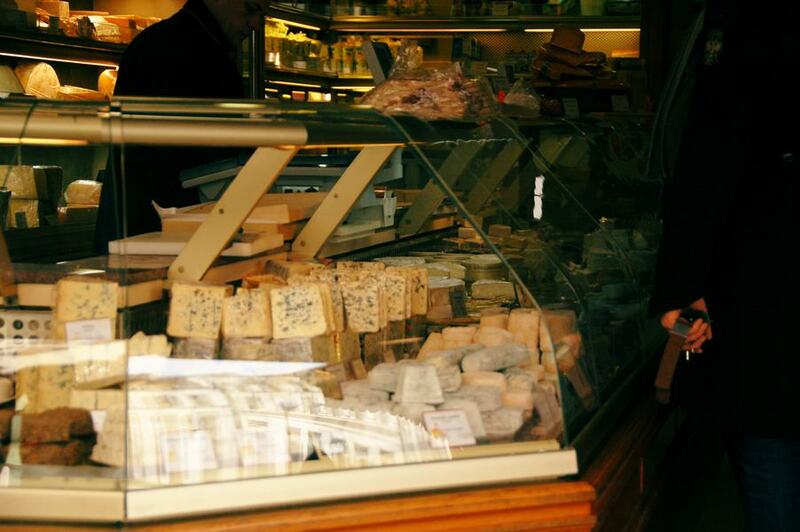 For other districts, here you can find a good list of recognized small cheese shops in Paris. 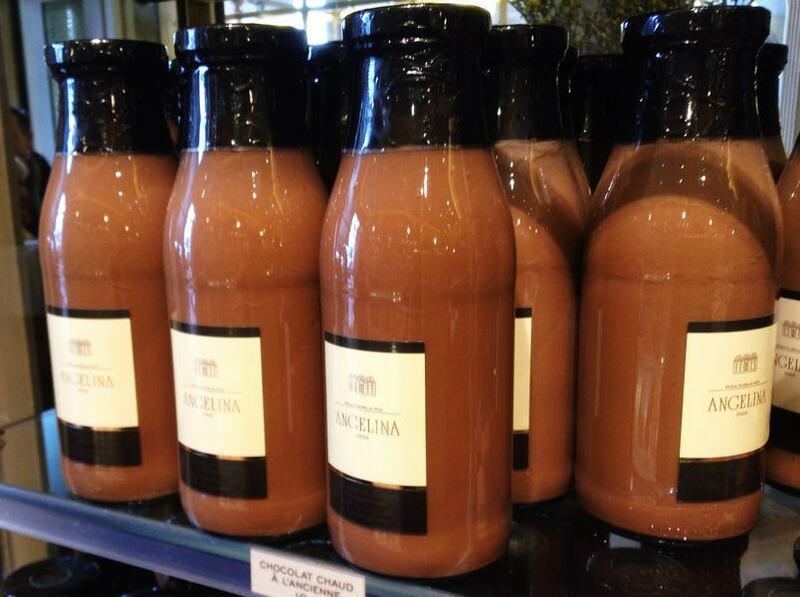 We do not know if this is the best hot chocolate in Paris but it sure is the most expensive because the cup to 7 € I doubt that others can overcome … In full rue de Rivoli, in the center of Paris, you have this chocolate crowded Japanese, Russians and other tourists. All of them by sheer reputation of the site and say they’ve been here. But we recognize it, sometimes we also exploring that, so that is without sin cast the first stone. Such is his reputation that has now opened branches in many of the museums in Paris (such as Luxembourg or the very Versailles of Louis XIV). If Angelica, the protagonist of the books of Anne and Serge Golon, revived but this time beyond the role would you have copied the chocolate that eventually led him to conquer the Sun King himself! L’Avant Comptoir (pancake), on rue d’Odéon just over the Carrefour de l’Odéon, under the square of the same name. Almost every corner you will find a dresser with baguettes stuffed to bursting. Are the sandwiches to Parisian. Neither good nor bad, just to stave off hunger. If you are lucky and the baguette is made recently that I love. And if you take a couple of hours in the window will not tell you anything but will fill the gut. They have good press the de l’Avant Comptoir in Carrefour de l’Odéon and the truth is that they are good, but perhaps more fame comes to them for being the younger brother of the neighbor and always crowded Le Comptoir. Beware that many plans do not get the Carrefour de l’Odeon and many go crazy looking for them in the plaza of the same name that is a little higher. If you are there go down the left hand rue Odéon and find them at the time. If you are on the Boulevard Saint Germain, you can always approach the rue de Seine, No. 54. There have Cosi, a small place with sandwiches made at home. It will be the best in Paris but will like and you can sit in a place not very special but nice to take a break between both Paris ride. 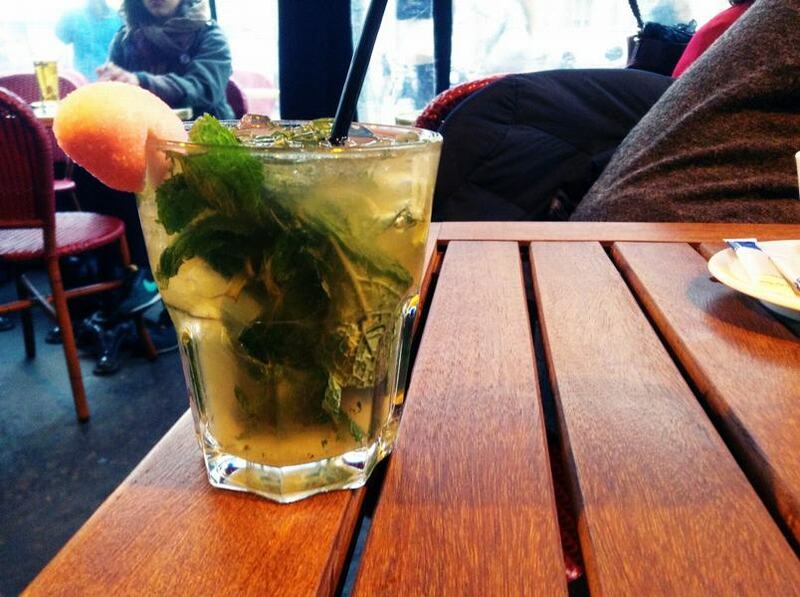 Le Marais is a trendy district in Paris and no wonder. Old Jewish Quarter, is the image of Paris that many imagine before coming. Streets or great or small, some pedestrian, with lanterns and cobblestones, romantic balconies and pleasant light. Nothing royal estates as though everything is a Paseo de Gracia, but low houses where it is easy to imagine living another life. If you want a quick bite, it’s best to try the most famous falafel Paris. 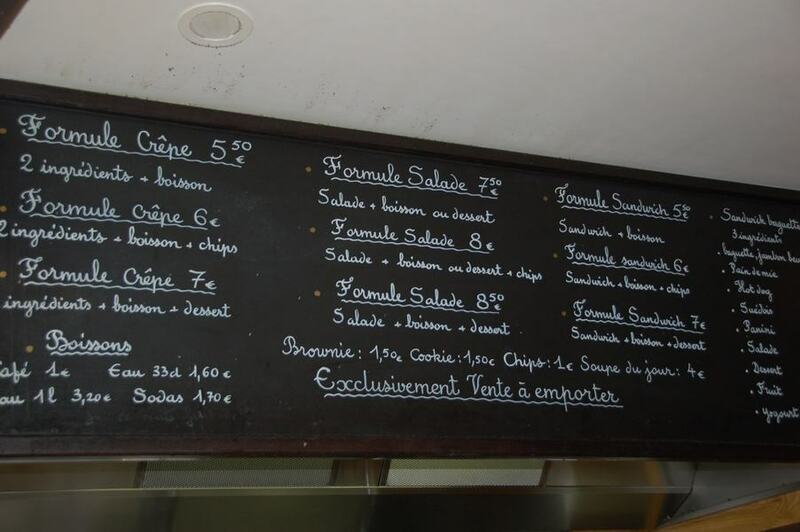 But if you want to eat well and relaxed, the best choice is Chez Janou. Such a good option is that you can not forget to book! But you nailed why. That’s one of the things that makes it great to Chez Janou, the dishes are really good without having to leave average portfolio. You have the classic duck breast (18 €) or bistro 300g entrecote (21 €), but if you dare to something a little different will surprise both the risotto with scallops (Saint-Jacques) (20 €) and the spaghetti with snails (16 €). And at the end of dinner, if you like a drink, you can approach the Centre Pompidou address rue Sainte Croix de la Britannique. The weekends always find friendly. At the junction with rue des Archives, you have the Open Coffee for example, but in any of the sites you will be at ease. If you want gay, right in this area will find several bars and even trendy restaurants.